Upper construction is made from lightweight microfiber material for flexibility, durability and abrasion resistance. Light microfiber front and rear bellow inserts offer improved comfort and flexibility in key area. Toe box is constructed from synthetic material for abrasion performance. 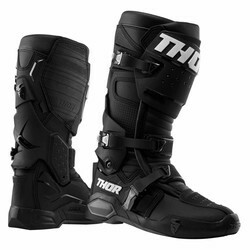 Injected TPU shin plate connected with theTPU medial protector panel; hook and loop grip upper closure, plus TPR flap for broad ranging calf fit adjustment and support. The ergonomic TPU triple buckle straps allow smoothfrontal flex from the medial protector to the lateral side without compromising range of movement. New closure system includes 3 polymer buckles with an innovative closure system. This closure includes a micro-adjustable ratchetwith memory and a quick release/ locking system with self-aligning design for easy, precise closure. All buckles are replaceable. Innovative one-piece TPU injected dualcompound foot shell, reinforced by a metal shank inside a co-injected toe reinforcement. Soft foam surrounds the ankles and collar offeringcomfort and shock absorbing performance. Entire textile interior lining for improved levelsof comfort and moisture-management. Replaceable EVA footbed with textile lining on top provides arch support and comfort. Alpinestars exclusive high grip rubber compound outsole provides grip and traction on varioussurfaces and is profiled to provide control and feel on the bike’s footpegs. The sole is replaceable.